PuzzleMad: Otis is Puzzled by the Green Eyed Lady! Otis is Puzzled by the Green Eyed Lady! My good friend Otis and I have corresponded via Facebook for a few years now. I did finally manage to meet him in real life at last years IPP in London and he was a delight to chat to and is also a brilliant puzzler. He is one of the few puzzlers who, like me, enjoys solving all types of puzzles including twisty puzzles. He has been very kind and has written me a guest blog post whilst I have been indisposed dealing with my Mum's illness and subsequent affairs after her untimely death. The subject of this post is one that I very rarely have a chance to write about - I try not to collect puzzle boxes to try and save my finances from total ruin. 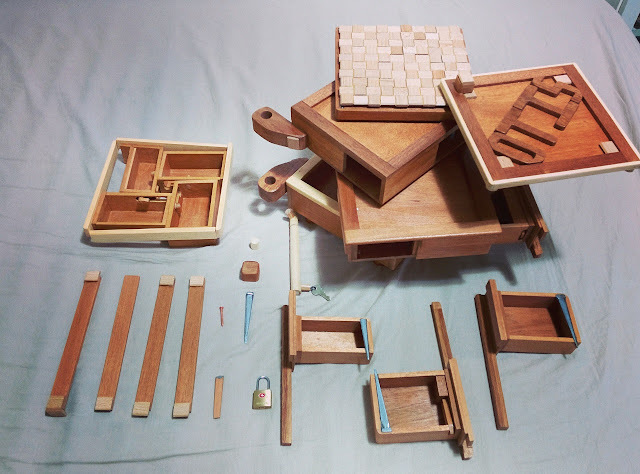 A newcomer has recently BURST onto the puzzle design and crafting scene - Tracy Wood Clemens aka "the Green Eyed Lady" has started producing beautiful and complex puzzle boxes to order. So far I have resisted the pull but after what I have seen she has made for others I am sure I will give in soon and have to order something from her. Please have a look at my New additions page to see some pics of quite a few new acquisitions that have arrived in the last week! Mrs S has been telling me off - gently because I'm a bit fragile just now!!! Around one or two months ago I saw a puzzle pic on facebook. It was a very good looking puzzle box which seemed challenging to solve. At that time I didn’t know who made this box and who is the owner of the box (His last name is on the box though, which I didn’t realize at the moment…...). So I left a comment appreciating the box and give a “like” for the pic. Later I received a pm from Tracy. That’s how we know each other. She asked me if I like puzzle boxes and said that she can make one for me if I wish. Of course I wish! But as you all might know I’m rather new to puzzle community without much experience. I can’t afford to spend too much on a puzzle, especially something which seems so awesome. The other concern is that I never meet Tracy before, never heard of her and of course have never tried her works. 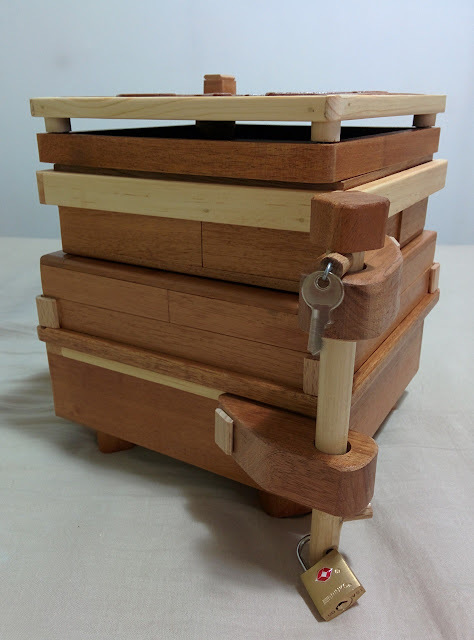 It might be hard for me to state a price for a puzzle box especially made personally for me. In the end I gave her a price and felt a bit reckless. Yes, that’s how you deal with Tracy. You give her a price, and then Tracy will make you something worth that amount of money. In my experience I don’t even know what my puzzle box will look like. But I don’t usually have to pay until I see the finished product. So not only are you buying a puzzle, but also the way of purchasing is very puzzling as well. At first I didn’t dare to speak too high a price as the reason above. But soon I regretted my decision. I saw from facebook that Tracy attended Jeffrey Aurand’s Rochester Puzzle Picnic. And finally I know that the very first box I saw had been made for him. 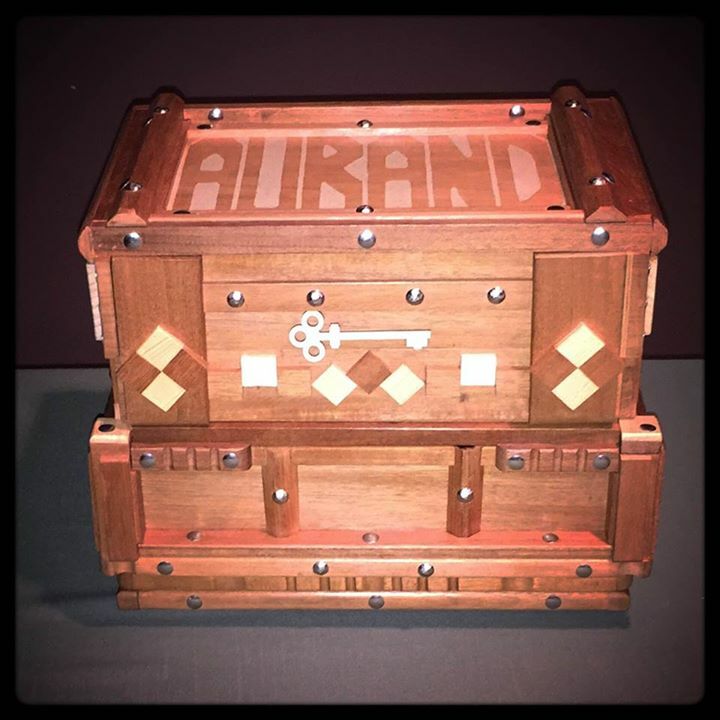 Lot’s of experienced puzzlers, including many IPP'ers, tried the Aurand Puzzle Box and they all left very good comments about it. This is the first moment I regret! 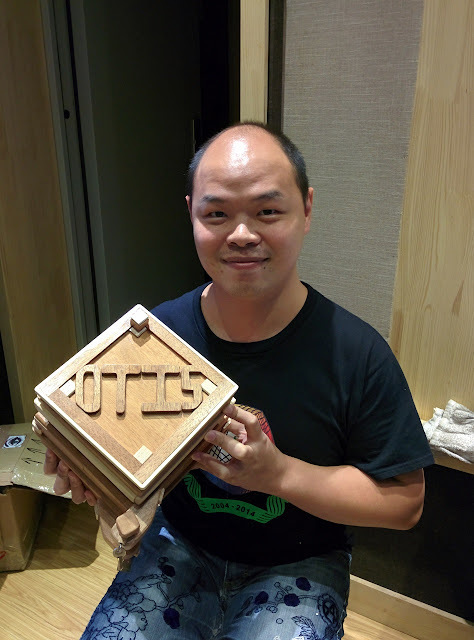 Some weeks later I saw another puzzle box made by Tracy. This time I knew the owner immediately. Jim Strayers, who is a very experienced puzzle player and collector had ordered a box from Tracy too! And immediately I could see that his box looks extremely good as well. This is the second time I regret. At that point, I contacted Tracy immediately to see if she had already begun making my puzzle box. Luckily she had not yet started. So I quickly raised the amount of my price, to prevent a third time of regret. Look at the size! It's huge! Back on topic. My box is named “Puzzled??? 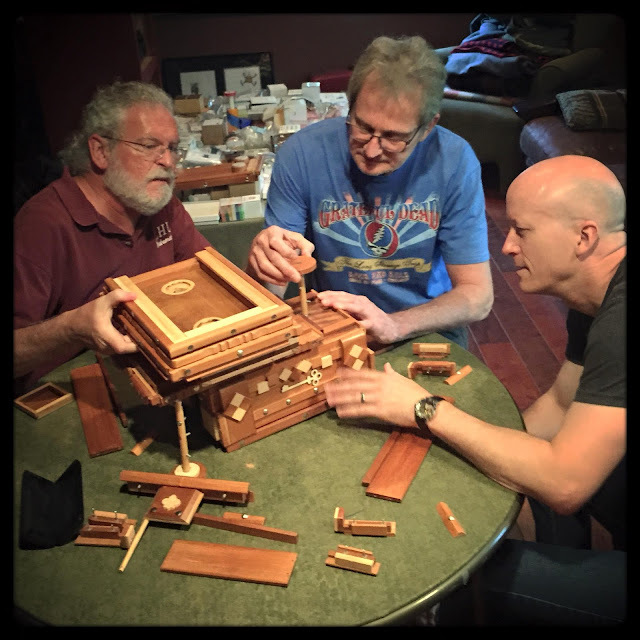 ?” - I consider this not only a puzzle box, but also a sequential discovery puzzle too. (editor's comment - I too am allowed a sequential discovery puzzle even if it is box shaped! YAY!) Usually the aim of a puzzle box is simply to open the box. In my case many different parts are disassembled and some become significant tools for the next procedure in the sequence. The box contains 6 layers. Each layers is different in thickness. On top my name Otis is shown by a few pieces of wood. Yeah that’s the only request I asked from Tracy. I’m not good at designing things so better leave this part to whom good at. The first layer can turn 360 degree free, while the second layer can only turn around 60 degree. There seems to be a few cutting lines on the fourth and fifth layer so may be there’re some parts which can be disassembled. On the front corner there’s a handle rod connecting the fourth and the sixth layer. There’s a key on top of the rod, and a lock at the bottom of it. So apparently I’ll have to use the key to unlock the lock. But it seems impossible at first glance. Look at all the layers and drawers - there's a lock too! I tried to solve it right after I was off from work. As I said above this puzzle is a combination of puzzle box and sequential discovery puzzle, so there’re actually two goals for me to complete. At first I think to open the box I’ll have to take something apart. That’s right, actually many different pieces were taken apart. Throughout the whole process I found a few “puzzle pieces” which seems can be matched together to make a construction. So I continue to look for any pieces I can take off, and what tools can be used to go further. Around two hours later, I had found all the puzzle pieces and the assembly was done. Maybe I have some chance on solving this puzzle box? At this point I think I’ve completed the second task but I was not sure if the box is being opened. It seems like it is opened, no more secret compartments are possible but the padlock is still locked. That seems like it is impossible so I thought the lock might be something to just divert my attention. I was wrong!! I should have contacted Tracy at that moment to make sure I was right. But I’m too keen to prove myself right and I looked at the solution. OK. The padlock can be unlocked. I missed this part. And I found that I did one procedure totally by luck at the very beginning. Apart from these two procedures, I had done everything right. So the box was finally opened, and I finally understand why this box is named as “Puzzled????”. I’m certainly really feeling puzzled right now! In conclusion, I really want to thank Tracy for making this special puzzle box for me. The solving process was a lot of fun. Lot’s of different skills and tricks are required to solve this box. Thanks to my previous experience of solving many puzzle boxes, I think the difficulty of the box is "moderate". I think that a puzzle greenhorn like me can solve it within a day. The box looks awesome, the mechanism works very well and it’s just BIG. It can be a real piece of furniture or just a box sitting on your desk! I would say that the price is totally worthwhile. 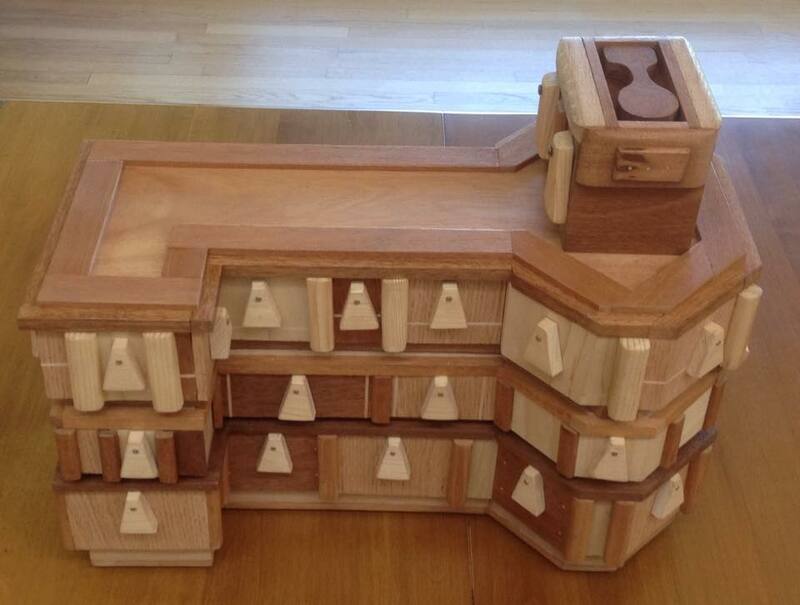 So for all of you who are interested on puzzle boxes, just contact Tracy Wood Clemons via Facebook! You will be surprised at what you’ll get! I won’t be shocked to see Tracy to become a famous puzzle box master among our puzzle community! Usually puzzlers don’t like to show one puzzle’s mechanism but consider this is the only one existing in the world I think showing a picture of the mechanism is not too great a sin. But if you really don’t want to be spoiled then you better stop reading from here. Look at all these pieces! 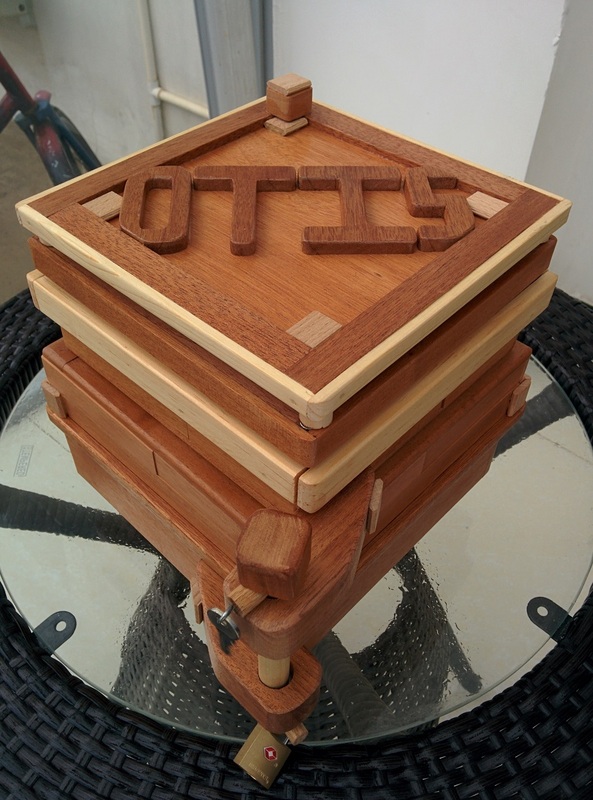 If you don't mind asking, what was the final price you paid for this beautiful puzzle Otis? Pm sent via facebook Gus! Beautiful box and great write up Otis! Thank you Steven, I'm looking forward to your "Into the drink" box blog too! Only a little editing was required! our English is a lot better than my Cantonese!! !